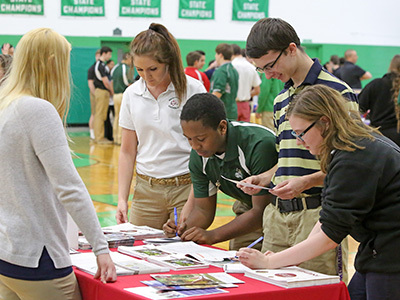 At Providence Catholic, we incorporate the Augustinian values of Truth, Unity, and Love into all we do. Learn more about our Augustinian identity in the Faith Life section of our website. 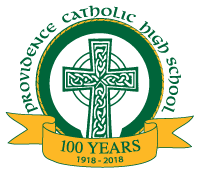 Inspired by our Augustinian values of truth, unity, and love, the Providence Catholic High School family is a vibrant community of believers and learners, one in mind and heart on the way to God. 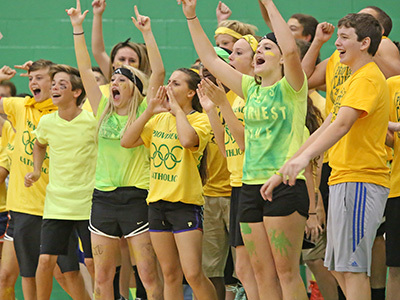 In our spirited pursuit of excellence as a college-preparatory school, we provide rigorous programs at all levels in academics, arts, and athletics, along with extensive extracurricular activities and opportunities. In our authentic desire to witness the Gospel message of Jesus, we provide spiritual programs that foster and promote an enduring commitment to a life of faith, prayer, and service. In a safe and supportive environment, our dedicated, talented, and highly qualified faculty and staff guide students to embrace individuality, challenge assumptions and grow in confidence and compassion. We invite young men and women, along with their families, to join us in the blessing that is Providence, and in so doing, become something greater together. Jesus Christ is the reason for our school. Prayerful community of believers, striving to be one mind, one heart in God. We live and teach the gospel of Jesus with a strong sense of family. Together we worship, celebrate, learn and share our faith in Christ as the source of our love, compassion and strength. College preparatory school. We enhance the lives of our young people through a focused curriculum which develops their full human potential, nurtures a positive self-image, and guides them to strive for excellence. Students become life-long learners who move beyond knowledge to wisdom, beyond information to truth. Healthy environment for spirit, mind and body. We provide a wide range of experiences both curricular and extracurricular that enhance a sense of belonging and well-being. We empower students to embrace the future with confidence, competence, faith and hope. Service oriented community. 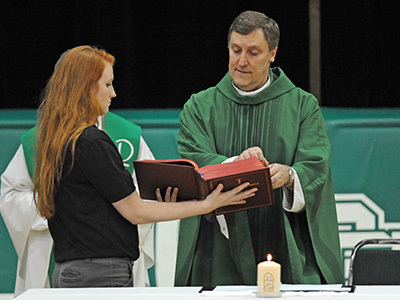 In serving God and others, students show the dignity and respect due human life. Made in the image and likeness of God, and under Christ’s guidance, we answer the call to become disciples.